The oil industry, the largest and most powerful corporate lobby in Sacramento, dumped millions of dollars into its successful lobbying efforts to eviscerate an already weak fracking bill, Senator Fran Pavley’s Senate Bill 4, at the end of the Legislative Session. Chevron, the Western States Petroleum Association and Aera Energy LLC spent the most money lobbying legislators in the third quarter of 2013, according to California Secretary of State documents. Chevron spent $1,696,477, the Western States Petroleum Association (WSPA) spent $1,269,478 and Aera Energy LLC spent $1,015,534. That’s a total of $3,981,489 just between July 1 and September 30, 2013. In the first three quarters of 2013, WSPA alone spent a total of $3,578,266 on lobbying legislators. In a classic example of the “pay to play” and “wine and dine” corruption that infests California politics, nearly $13,000 of the Western States Petroleum Association’s third quarter spending went toward hosting a dinner for 12 lawmakers and two staff members in September. The dinner was held on September 4, as Senate Bill 4 was awaiting a vote on the Assembly floor. The oil industry the next day added amendments that further weakened the already weak legislation opposed by a broad coalition of over 100 conservation, environmental justice and consumer groups, including Food and Water Watch, the Center for Biological Diversity, the Credo Campaign and California Water Impact Network (C-WIN). • Language added to the bill specifies that “no additional review or mitigation shall be required” if the supervisor of the Division of Oil, Gas and Geothermal Resources “determines” that the proposed fracking activities have met the requirements of the California Environmental Quality Act. • In addition, under existing law, the governor and DOGGR can deny approvals for wells that involve fracking or place a partial or complete moratorium on fracking. The new language states that DOGGR “shall allow” fracking to take place until regulations are finalized in 2015, provided that certain conditions are met. At the last minute, the League of Conservation Voters, NRDC and two other Senate Bill 4 backers withdrew their support for the legislation. However, the bill, having been given “green cover” by these NGOs, passed through the Legislature a week after the dinner. Governor Jerry Brown, a strong supporter of the expansion of fracking in California, then signed the legislation on September 20. “For Perea, Correa, Calderon and Torres, the September dinner was not the first time they’d been treated to The Kitchen by the oil industry. They were among 11 legislators who attended a Western States Petroleum Association dinner there last year, valued at nearly $11,000,” Rosenthall noted. Prior to the latest Secretary of State filing, a report released by the American Lung Association revealed that the oil industry lobby, the biggest corporate lobby in California, has spent $45.4 million in the state since 2009. The Western States Petroleum Association (WSPA) alone has spent over $20 million since 2009. Oil and gas companies spend more than $100 million a year to buy access to lawmakers in Washington and Sacramento, according to Stop Fooling California, an online and social media public education and awareness campaign that highlights oil companies’ efforts to mislead and confuse Californians. In addition, Robert Gammon, East Bay Express reporter, revealed that before Governor Jerry Brown signed Senator Fran Pavley’s Senate Bill 4, Brown accepted at least $2.49 million in financial donations over the past several years from oil and natural gas interests, according to public records on file with the Secretary of State’s Office and the California Fair Political Practices Commission. The oil industry not only exerts influence by direct contributions to political campaigns, but by getting its lobbyists and representatives on key panels like the Marine Life Protection Act (MLPA) Blue Ribbon Task Force. In one of biggest environmental scandals of the past decade, Reheis-Boyd served as chair of the MLPA Initiative Blue Ribbon Task Force to create alleged “marine protected areas” in Southern California. She also served on the North Coast, North Central Coast and Central Coast task forces from 2004 to 2011, from the beginning of the process to the end of the process. The MLPA Initiative process overseen by Reheis-Boyd and other ocean industrialists created fake “marine protected areas” that fail to protect the ocean from fracking, oil drilling, pollution, wind and wave energy projects and all human impacts on the ocean other than fishing and gathering. State officials and representatives of corporate “environmental” NGOs embraced and greenwashed the “leadership” of Reheis-Boyd and other corporate operatives who served on the MLPA Blue Ribbon Task Forces to create “marine protected areas” that fail to actually protect the ocean. By backing her leadership as a “marine guardian,” they helped to increase the already powerful influence of the Western States Petroleum Association and the oil industry. There’s no doubt that the Western States Petroleum Association, Chevron and other oil companies use every avenue they can to dominate environmental policy in California, including lobbying legislators, contributing heavily to election campaigns, serving on state regulatory panels, and wining and dining politicians. 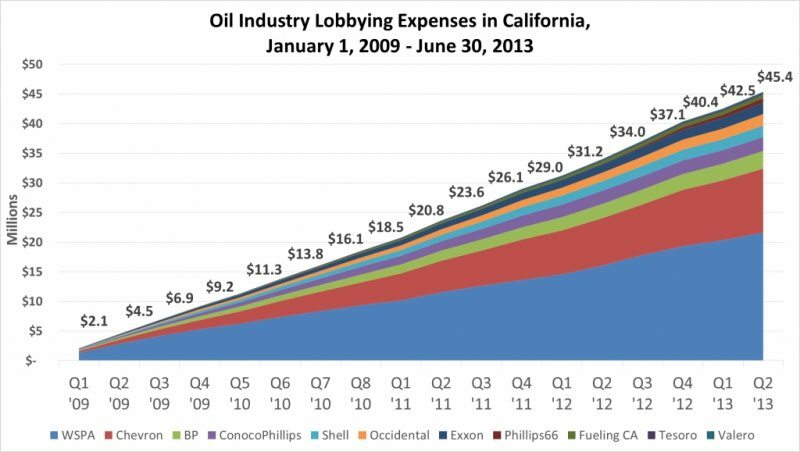 Until we get the big corporate money out of politics, California will continue to be awash in a sea of oil money.